Nine people have been taken to hospital following a collision between a Luas tram and a bus in Dublin. The incident happened at Queen Street in Smithfield, and the road is closed while emergency services attend the scene. Dublin Fire Brigade have said that there are no life-threatening injuries reported. Gardai have stated that Queen Street is expected to be closed until at least lunchtime today following this morning’s collision and that diversions are in place. 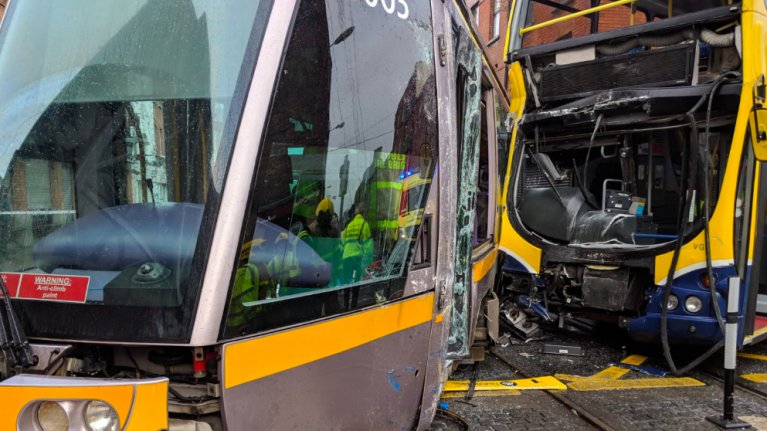 Dublin Fire Brigade also said that: "Firefighters/Paramedics from Phibsborough and HQ responded to collision between a Luas tram and a bus this morning on Queen Street. 9 people treated and transported to hospital by DFB and NAS ambulances. No life-threatening injuries. Expect delays in the area." The incident occurred at around 7am and the tram was derailed in the crash. RTÉ have reported that the people were taken to hospital as a precaution. The injured people include the driver of the tram and four ticket inspectors. The Luas have stated that services are now running from Tallaght/Saggart to Heuston. There is no service between Museum and Connolly/The Point. Luas tickets valid on Dublin Bus. Further updates will be available via the Luas social media account. Service Disruption on the Red Line due to an incident in the City Centre. Services are operating from Tallaght/Saggart-Blackhorse. No service operating between Blackhorse-Connolly/The Point. Tickets are valid on Dublin Bus. See https://t.co/FiPHSSPLZt for more information. #Luas Red Line Travel Update. Due to an incident at Queen St there are no Luas services between The Point/Connolly and Drimnagh. There is a full service however running between Saggart/Tallaght and Blackhorse. Luas tickets valid on @dublinbusnews. ⚠️Red Line service update: Services operating between Tallaght/Saggart and Blackhorse only. No services operating between Drimnagh and The Point/Connolly due to an earlier incident at Queen St. Tickets are valid on Dublin Bus. Please see https://t.co/GkL4FmFo1J.